In rural Pierce County, Wisconsin, a bear recently got herself into an unbearable situation and on Wednesday, the Pierce County Sheriff's Department released the amusing photographs. 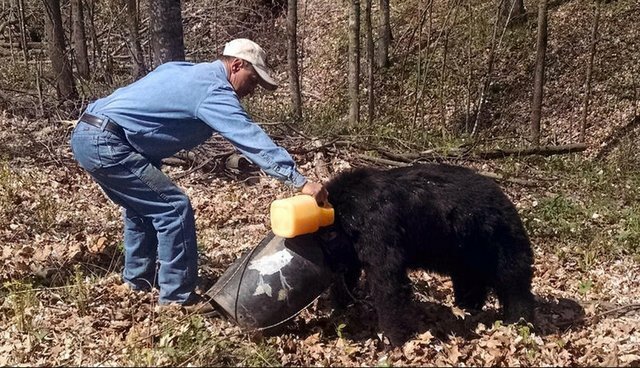 Last Saturday, a passerby spotted the bear, lying on the ground, with its head stuck in some sort of pail. In cartoons, it's usually a jar of honey, but this time, it was an old milk can or bucket. The Pierce County authorities were notified, and local deputies and Department of Natural Resources conservation officers arrived on the scene. Its cub was spotted nearby in a tree, but took off when concerned citizens approached, After a number of unsuccessful tries to pull the milk can off the bear's head, including tying ropes to the can's handles, a quick thinking resident came by with a jug of cooking oil. Since the exhausted bear was already on the ground, rescuers used an ax to chop holes in the can, allowing the bear to breathe more easily, before trying with the oil. A brave soul ambled up to the bear, poured the oil on its neck and the openings of the can, and stepped back. The bear was able to pull the can off. Once it was free of the can, she ran off into the woods, presumably after her cub. The can, which the bear left on the ground after she took off, had artwork painted on it, and was believed to be an area resident's lawn decoration. A sweet ending to what could have been a 'grizzly' situation. If you'd like to receive more free articles about interesting and funny animals, please subscribe!